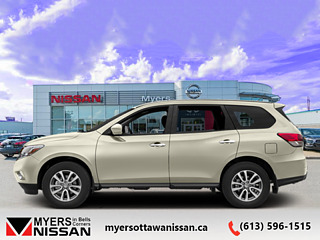 With technology for both driving and connectivity, this Pathfinder is the pinnacle of modern SUVs. 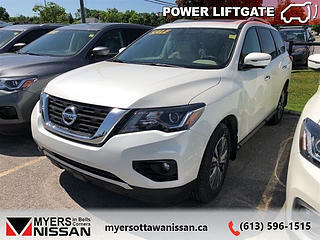 This 2019 Nissan Pathfinder is for sale today in Ottawa. 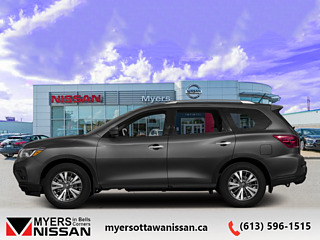 This 2019 Nissan Pathfinder is equipped with all the latest in safety features, allowing you to take on any road with the confidence that your passengers are safe, while a heritage of over 30 years assures you this Pathfinder can tackle anything you take it on. Whether a long roadtrip or a backcountry getaway, the Nissan Pathfinder is built to conquer every journey with comfort and ease of mind.This SUV has 15000 kms. It's gun metallic in colour. It has an automatic transmission and is powered by a 284HP 3.5L V6 Cylinder Engine. 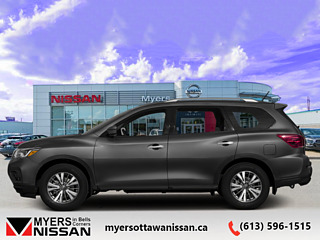 This vehicle has been upgraded with the following features: Navigation, Heated Seats, Remote Start, Rear View Camera, Heated Steering Wheel, Blind Spot Warning, Android Auto. 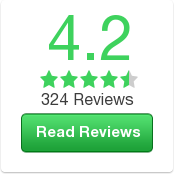 Our Pathfinder's trim level is 4x4 SV Tech. This Pathfinder SV has all the tech you would expect from a modern SUV with intelligent 4x4 with hill descent control, 4 wheel independent suspension, aluminum wheels, LED daytime running lights, auto on/off headlights, fog lights, heated power side mirrors with turn signals, blind spot warning with rear cross traffic alert, and automatic emergency braking for convenience, safety, and driver assistance, and an 8 inch NissanConnect multi-touch display with navigation, Apple CarPlay and Android Auto compatibility, SiriusXM radio, Bluetooth control and streaming, MP3/WMA playback, aux and USB inputs, RCA video input, and AM/FM/CD audio for connectivity. The interior has some great comforts with an Advanced Drive-Assist instrument cluster display, rear sonar parking assistance, rear view camera, remote start, remote keyless entry, tri-zone automatic climate control, intelligent cruise control with adaptive speed, heated leather steering wheel with cruise and audio controls, heated front seats, power driver seat, and ample cup holders and storage cubbies.